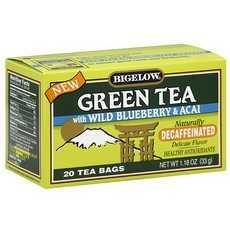 Enjoy Bigelow Green Tea with Blueberry and Acai(6x20 Bag). Mother Nature gave us a wonderful gift when she packed beneficial antioxidants into Green Tea - powerful combatants that protect the body's healthy cells from billions of naturally occurring "free radicals," unstable molecules that when left unchecked, may lead to a host of degenerative diseases. Studies show that drinking 2-3 cups of tea per day may improve your chances of fending off these invaders. Linger over a cup just once and you'll know that Bigelow Green Tea with Wild Blueberry and Acai, rich in antioxidants with less caffeine than black tea, is like no other. The exciting taste of blueberry is masterfully blended with the delicate green tea before wrapping each tea bag in its own protective pouch to seal in all the wonderful flavor and freshness. (Note: description is informational only. Please read product label prior to use and consult your health professional with any question prior to use.